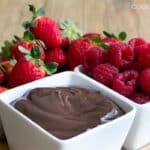 This chocolate fruit dip is delicious, easy, HEALTHY and it only takes a couple minutes and a few ingredients to make. The basic ingredients are Stonyfield Greek yogurt, cocoa, brown sugar and cinnamon. So if you’re looking for a perfect Valentine’s Day treat that isn’t too bad for you but is too decadent, you’ve found it! Pin this to your Chocolate Board! I don’t enjoy baking. Or making desserts. It’s not something I can explain. It’s just the truth. But even though I don’t like to make desserts, I do like to *eat* desserts. When I crave something dessert-like I need it to be effortless. And given the number of calories I swallowed over the holiday season, I also need it to be healthy. That’s why I invented this chocolatey, decadent yet healthy fruit dip made of Stonyfield Organic Greek Yogurt, cocoa and brown sugar. There’s cinnamon in there too. I loooovvvveeee cinnamon and chocolate together. Oh, and there’s an optional pinch of cayenne to give this fruit dip pizzazz. I swear, it’s the easiest and tastiest thing I make when friends visit. Just mix and serve. Even I don’t mind doing that! If you actually want to splurge a bit more for Valentine’s Day, like, you want some cream cheese instead of yogurt, I get that. And I have just the thing for you. Check out this Red Velvet Cheese Ball. Yes. Really. OK, now let’s dig into this chocolate yogurt fruit dip! 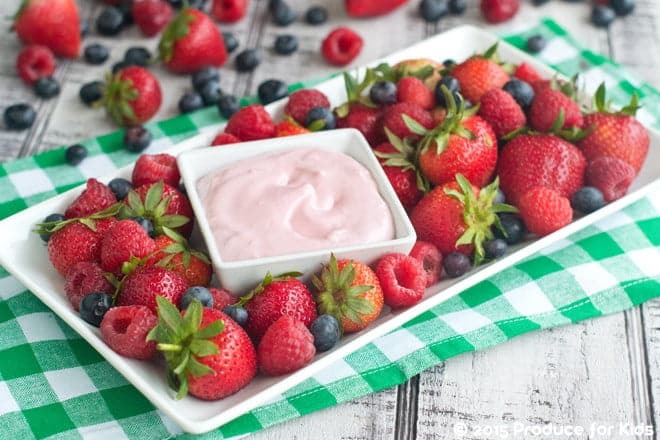 This fruit dip is easy to make, healthy AND decadent. 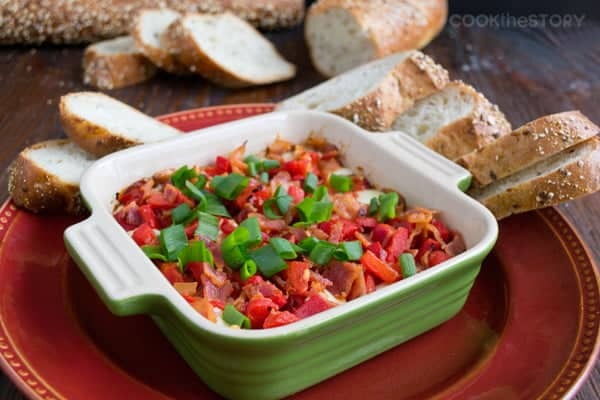 It's the perfect dip to make when company is coming over for coffee or drinks. The cayenne pepper in the recipe is optional. Try adding a tiny pinch, mix it in and then taste. You shouldn't be able to tell it's there. It's just a little background tingle that makes the dip extra special. Disclosure: This post originally contained a giveaway. Simply Organic and Stonyfield provided the items for giveaway and also provided me with an identical herb and spice gift pack and yogurt coupons for my own use. All opinions are my own. This post was originally published in December, 2013. Revised January 2016. I made this with 1 TBSP honey instead of brown sugar and it was perfect for our crepes! Rachel, Crepes are a perfect use for this dip. Yum! And thanks for letting me know about the substitution. Great idea! I like the look of this but I’m wondering if I can make it ahead, 1-2 days in advance? Or does it separate? Sarah, It can definitely be made ahead and it doesn’t separate. Store it in a sealed container in the fridge. It will stay good until whatever the best before date was on your container of yogurt. Give it a stir before serving. Each tablespoon (12g) of brown sugar contains 46 kcal (and 11.8g carbohydrates) and each tablespoon (5g) of cocoa powder provides 12 kcal | Protein 1.1 | Fat 0.7g | Carbohydrates 3.1g | Fiber 2g. It should help to calculate exact nutritional value of the dressing with any type of yogurt. Other ingredients don’t influence final numbers almost at all. Thanks for the help, Kate! What is the nutritional values for this dip. This dip is soooo good. I don’t have the nutritional values. It would basically be whatever your yogurt’s values are plus a tiny bit of fat from the cocoa and some calories for the brown sugar. I’m so happy you like the dip! Hi, just wanted to say thanks for this recipe. I served it with strawberries for dessert and it was a treat. It was surprisingly refreshing. Perfect for a hot Sunday in the tropics! Btw, which type of cocoa powder did you use? I used Hershey’s unsweetened 100% cocoa powder. Mine turned out into a much lighter brown colour than yours did in your photo. This is excellent!! I am always being given plain Greek yogurt, which is a challenge since I don’t like it. This is a wonderful way to use it up. We had it with drained mandarin oranges, marshmallows, graham crackers, & brazil nuts. All stuff I want to use up. AND it was a lot of fun! This is a great recipe! I replaced the brown sugar with a tablespoon of maple syrup. 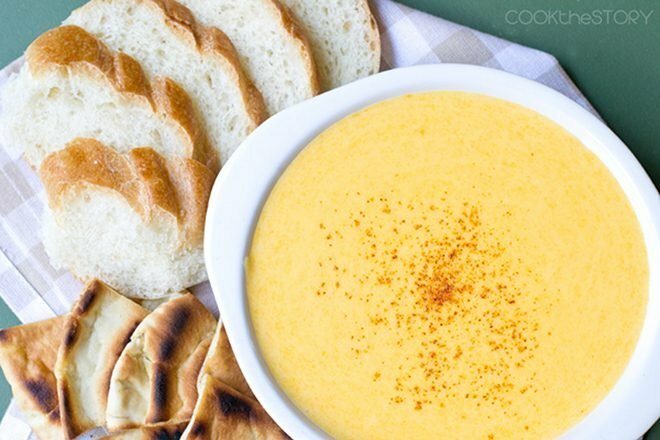 This is a great fall treat with apple wedges! I adore this! I am fond of Greek yogurt, but never thought of using it this way. Also, the same for cinnamon!!! 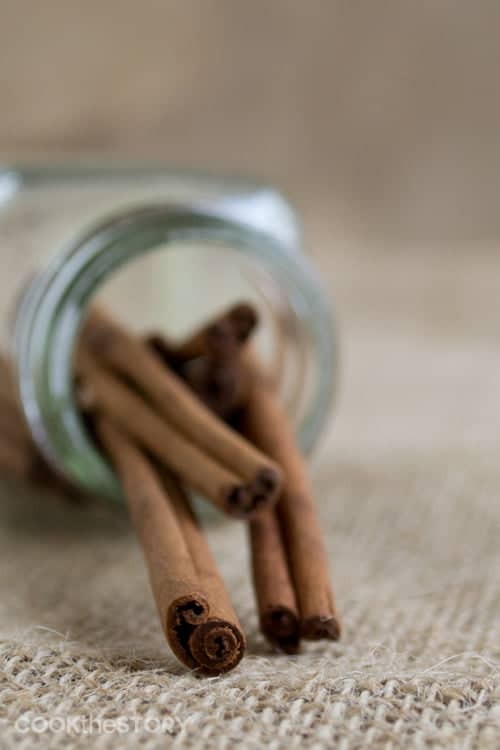 I’m into fall baking and I’m crazy for cinnamon, and this is a perfect way to use it – unexpected little add to an already super treat!!! Wow! I liked it a lot! I found myself scraping the rest of the bowl when it was pretty much gone! But it definitely didn’t taste like expected it to.. It tasted very cinnamon-y to me and I expected it to taste more chocolate-y. Is there a way to fix this the next time I make it? I definitely want to make it again! My favorite fruit dip is simple: greek yogurt, cinnamon and honey. I often have fruit with yogurt and honey for lunch, but I don’t think of it as a dip. One thing I do like for dessert with fruit–especially strawberries–is sour cream mixed with a little brown sugar. Simple but really good. Christine, I don’t know if you got my response about the lime yogurt dip . . . I responded but it only seems to appear if you ‘hover’ over the Reply button (which is really weird). But, in case you can’t see my response, here it is . . . the lime yogurt dip is 8 oz Cool Whip (I use light) and 2 6oz containers of Yoplait Key Lime yogurt mixed together. Easy peasy. I actually got the recipe from another food blogger (http://www.iheartnaptime.net/key-lime-yogurt-fruit-dip/). I imagine it would be good with any kind of yogurt; I just happen to love key lime. Sharon, This sounds fantastic! Thanks so much. Can’t wait to give it a try. Looks yummy. I love fruit with yogurt dip, the cocoa can only make it that much better! what flavor yogurt to use? plain? vanilla? Dayna, I use plain. You could use vanilla but then I would add less brown sugar. Start with 1 tablespoon, taste and add more if necessary. I have a lime yogurt fruit dip that is easy and delish! 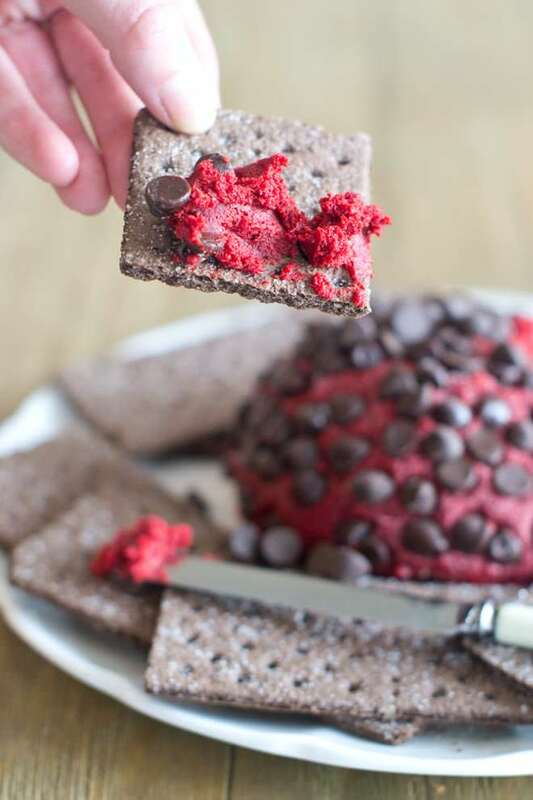 This dark chocolate yogurt dip sounds heavenly! Christine, It is very easy — 8 oz Cool Whip (i use light) and 2 6 oz containers of Key Lime yogurt (I used Yoplait, but I am sure it would be good with any preferred brand of key lime flavored yogurt) and just mix it together. It has a nice lime flavor, not overpowering and is very refreshing. I imagine that you could use any flavor of yogurt. (I got the recipe from another food blogger: http://www.iheartnaptime.net/key-lime-yogurt-fruit-dip/). Enjoy!! This sounds yummy! I love dark chocolate and love Greek yogurt . . . will definitely have to try this! Sharon, thanks so much. If you try it, do let me know. I’d love to hear what you think. 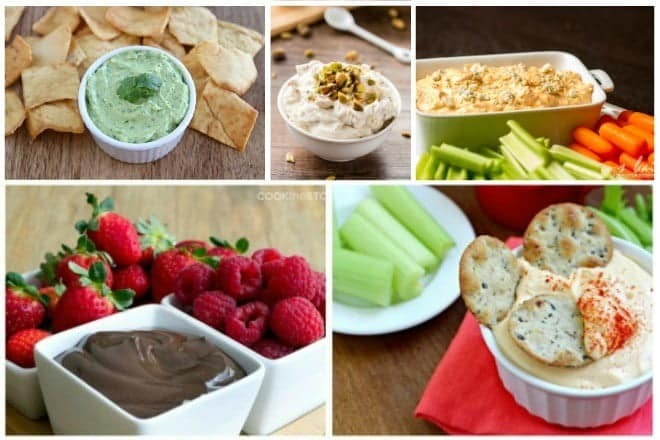 My favorite fruit dip would be simple–Greek yogurt with honey. Ada, I also love Greek yogurt with honey. Or with fig preserves! That’s what I had for breakfast today. It was wonderful. A mixture of yogurt and cream cheese with lemon and vanilla. Karen, I’m curious: Does it end up tasting a bit like cheesecake? I do a drizzle on pastries that has cream cheese in it and that’s the effect I get. Love it! Yes it does. Sometime I want to do a mixture with some Greek yogurt to lower the fat content. I think it would be great with Greek Yogurt. Or even just half as Greek Yogurt. Worth a shot! 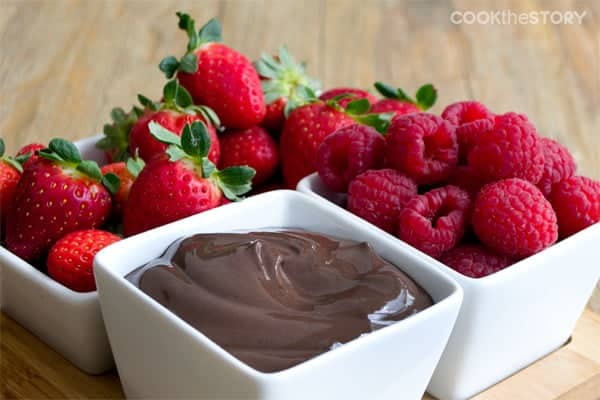 I love caramel or chocolate dip with fruit! Barbara, I agree! Caramel is one of my favorites too. My favorite fruit dip is marshmallow fluff and cream cheese whipped together. Yummy!! Heather, That sounds AMAZING. Is it equal amounts of fluff and cream cheese? I have to try it! yes, I usually use a small jar of fluff and an 8 oz block of cream cheese. Whip together and enjoy! You can eat it with spoon, it’s that good!! Heather, I am absolutely swooning. I might have to go get the ingredients to try it immediately! Raspberry yogurt mixed with cool whip. So light and delish! Jennie, That sounds so good! Is it equal amounts yogurt and cool whip? I can’t wait to try it. Elizabeth, My kids dip fruit in plain (or flavored) yogurt all the time. It’s a favorite of theirs for sure. Our favorite fruit dip is homemade carmel. served warm. Jan, I haven’t made caramel in years. Thanks for the reminder. I know it would be a treat for the kids to see how it’s made. And then to eat it! 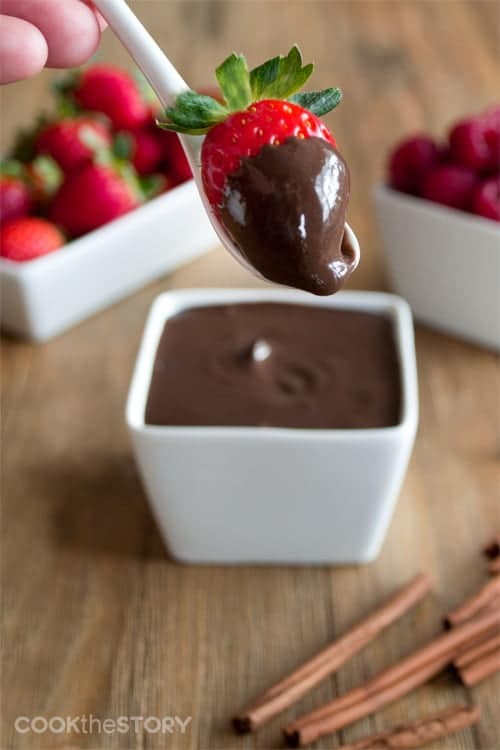 This chocolate dip sounds amazing! I also really love apples with caramel. Emily, Thanks! I love apples with caramel too. Even the packets you can get of them now. Such a perfect treat. Reminds me of eating caramel apples as kids. Dee, That’s a favorite for me too! Yum! my fave is a caramel dip. Itzia, I love caramel dip too. Especially with apples. yum! It’s a marshmallow fluffy and caramel dip! Soooo yummy! Megan, PLEASE tell me how to make this. Sounds sooooo good! I love dipping fruit into lime flavored yogurt. So refreshing! My favorite fruit dip is lemon curd mixed with vanilla yogurt, so light and delicious! Sheri, What an amazing idea. I love lemon and vanilla together. Do you use equal amounts of curd and yogurt or would the lemon flavor be too strong? I like Greek Yogurt, seasoned with spices (cinnamon, etc) and some brown sugar. MaryB, That sounds wonderful. I bet a cinnamon dip with apple slices would be incredible.